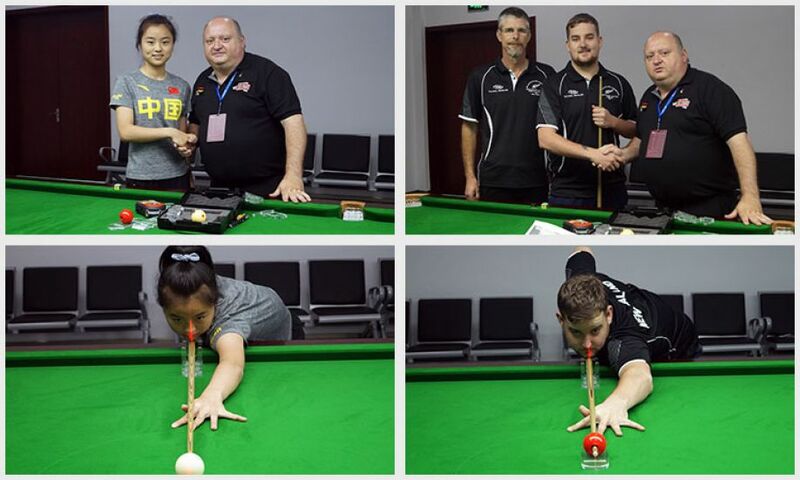 The last of the IBSF Cue Zone was held this morning by Irelands PJ Nolan on the 10th of July at the 2018 IBSF World Under 21 Snooker Championships in Jinan, China with players from New Zealand and China. The Cue Zones have been a huge success with positive feedback from all the countries who attended. The IBSF hope to make the Cue Zones a regular activity at all IBSF Championships in the future. Ryan King from New Zealand and Yulu Bai from China attended. PJ worked on their Break Building, Developing good fundamentals in their Techniques. All the players really impressed PJ with their commitment and the players said they really enjoyed their lesson. Each player who attended PJ’s IBSF Cue Zones this week in China received a Practice Booklet with routines and a sports psychology booklet to help them improve their mind fitness. The Cue Zones from the 5th – 10th of July had been organised by The International Billiards & Snooker Federation to promote the games. IBSF European Head Coach PJ Nolan conducted free cue zones each morning from 10am – 1pm with the compliments of the IBSF and the IBSF would like to thank PJ on a superb job during the Cue Zones in China.